"Looking for a real-world approach to a healthy Paleo diet? Look no further. Julia has created a safe haven with Paleo Power Bowls, where you can enjoy satisfying flavorful meals while still looking after yourself. Her realistic attitude toward dietary restrictions allows you to tailor the paleo diet to suit your lifestyle and wellness goals. Grab a fork and dig into a big bowl of delicious nourishment." "There is great power in simplicity and that includes getting back to basics with the foods we eat, removing inflammatory, overly processed "food" and honing in on nourishing basics. 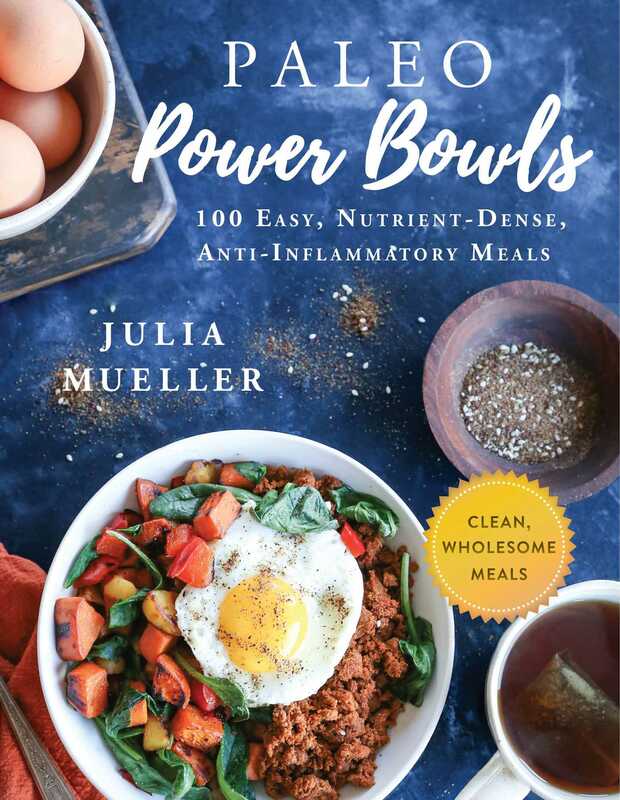 In Paleo Power Bowls, Julia Mueller shows you how to navigate clean eating, including a thoughtful approach to eliminating foods and reintroducing them; in addition to showing you the perfect formula for creating a nutrient-dense, balanced, and delicious meal in a bowl." "In Paleo Power Bowls, Julia has managed to capture what paleo cooking is all about--transforming simple, real foods into beautiful, nourishing meals. This book is more than just a collection of recipes; it's an inspiring approach to an intuitive way of eating. The stunning photos and mouthwatering flavor combinations are sure to get you into the kitchen!" "Julia's mission is to help her audience enjoy satisfying, flavorful meals while still taking care of themselves. . . . Paleo Power Bowls is filled with some of her favorite recipes for paleo meal prep power bowls! . . . Y'all really need to pick up a copy." "This is Julia’s third cookbook, and I think this one might be my favorite. . . . Julia is the vegetable whisperer." "Not only is this book absolutely packed with gorgeous looking food, but it’s also the kind of cookbook you could eat from indefinitely. . . . The extra special thing is that it’s ‘digestive friendly’ for those of us who struggle with those sorts of issues. But it’s also perfect for anyone who doesn’t have any diet restrictions or food intolerances—because everything is so bright, beautiful, and packed with flavor and veggies." —Kari Peters, blogger at Get Inspired Everyday! "Each and every recipe was created so thoughtfully with the right balance of protein, carbs, color and texture. The recipes are truly a feast for the eyes and they’ll make your belly rumble just looking at them! . . . I highly recommend Paleo Power Bowls, whether you’re having gut issues, are following a specific diet, or just want to prepare great tasting, healthy food. It’s truly a special cookbook that I’ll turn to week after week."